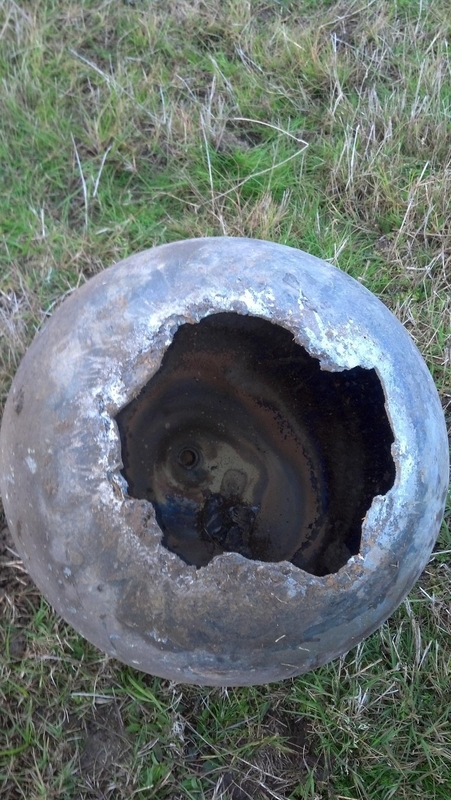 The mysterious metal sphere found in Buna, Texas, bears signs of extreme heat exposure as if having undergone reentry (Credits: Dean Gentz). It was late February 2013 when Dean Gentz, an American electrician, spotted a strange object in his cow pasture near the tiny town of Buna, east Texas. First, he didn’t pay any special attention to it thinking it was most probably just another toy his nephews and nieces had left around. When he finally decided to pick it up, he was astonished – the brown metallic sphere might from afar have resembled a ball, but most definitely was not. The 35 cm diameter object didn’t look like anything Mr. Gentz had ever seen before. Dean Gentz and his mysterious space ball (Credits: Dean Gentz). But Dean Gentz was intrigued. He admits the thought of space debris crossed his mind rather early, but at first he dismissed it. What are the odds that you will find a piece of space junk in your garden? Far less than winning a lottery! On the other hand, this was east Texas, exactly the same area that, in February 2003, was showered with hundreds of pieces of debris after the tragic reentry of the Space Shuttle Columbia. During the extensive search organized by NASA after the disaster, locals got kind of accustomed to seeing reentry damaged fragments around the place. But this looked somehow different. Dean’s curiosity was stirred – the ball seemed rather light for its size and the plug on the opposite side of the sphere was obviously hand machined and really small. “Then I saw what I thought was a sure sign it was from the aerospace industry. 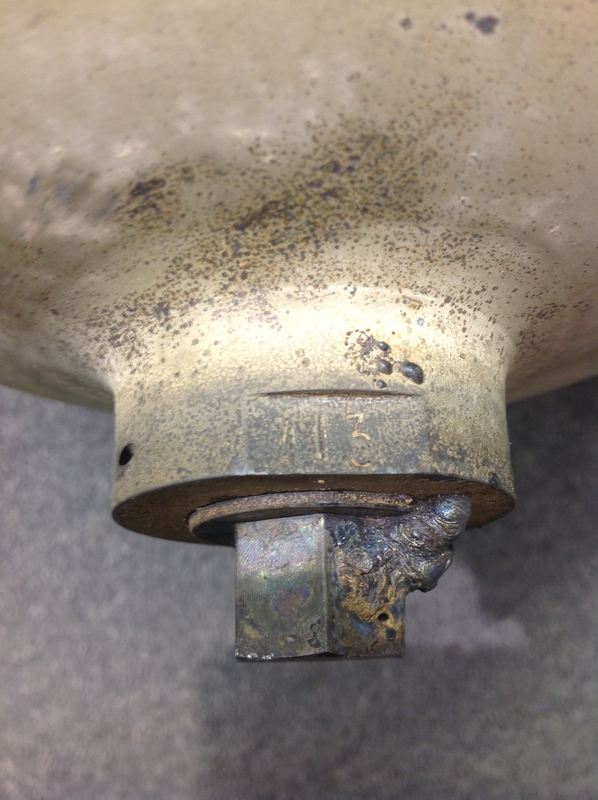 The plug and the ‘bung’ where the plug was screwed in, were both drilled twice for safety wire. That was the biggest thing – the safety wire holes!” he recalls. A close look showed Gentz that the plug had been hand machined and sported two holes for safety wires (Credits: Dean Gentz). Together they made a decision – the fastest way to learn more about the object would be to analyze its chemical composition. Luckily, the labs of Dean‘s employer are equipped with some rather high tech machines, so the next day, he took the object with him to work and ran a couple of tests on it using the Positive Material Identification Unit. “It takes a few seconds for the machine to display the reading. When it popped up, the guy running it said ‘what the hell is Ti?’ The machine read: Ti 91.25%, V 4.70%, Si 2.05%, Fe 0.098%, Zn. 0.015%, Mo 0.013%,” Dean recalls. Still reluctant to accept that he might have been “so lucky” as to find space debris in his own backyard, he decided to do more research. Eventually he stumbled over the website of space enthusiast Paul Maley and together they reached out to NASA and the Aerospace Corporation. The question of when exactly Dean saw the object the first time soon popped up. And even though he was dead sure it was on February 28 when he picked it up, he couldn’t recall how long the sphere had been lying there before. A few days after Gentz found a mysterious titanium tank in his pasture, a neighbor turned up this one (Credits: Dean Gentz). This is the point where the first cracks in the story appear. Dean was genuinely excited when an email from an Aerospace Corporation engineer arrived claiming that on February 27 a reentering Chinese rocket CZ-4B flew exactly above Buna and that it was highly likely if the object actually was space debris, that it would have been related to this body. Good news you might say, but Dean decided to be honest with himself – he believed it had been lying in his field longer than just one day. Was his memory fooling him? Soon after, a similar sphere was discovered in a nearby pasture and eventually the whole mystery was leaked to local media – something Dean himself is not really enthusiastic about. Rather than creating a UFO-like sensation, he would prefer to learn the truth about the titanium sphere that appeared out of nowhere. In fact, it definitely must have come from somewhere. So far, NASA has exhibited no interest in Gentz’s find and many questions remain to be answered. If you have any idea what the object might be, let us know. We will keep you posted on the developments and hopefully will be eventually able to find the truth. Even though the probability is low, it might be good knowing what to do if you ever happen to find a “space ball” in your own backyard. It seems a bit unlikely that these could be from STS-107. They were found clearly visible in the middle of pastureland – someone would surely have spotted them earlier, don’t you think? One would also expect serial numbers or other markings on Columbia tanks. As of our latest information, ATK has confirmed the tanks are not of their manufacture. That NASA has no interest in it speaks volumes, loud and clear.